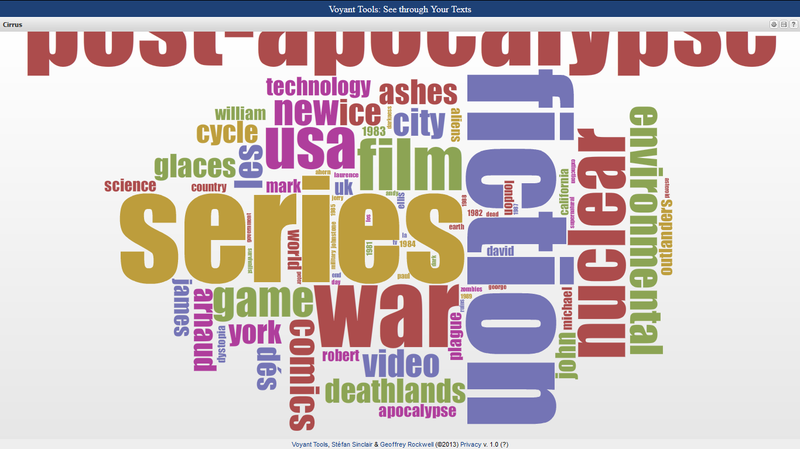 With the database of apocalyptic fiction now at around 1500 entries, I ran it back through one of the tools I had used early on in the process, Voyant Tools. 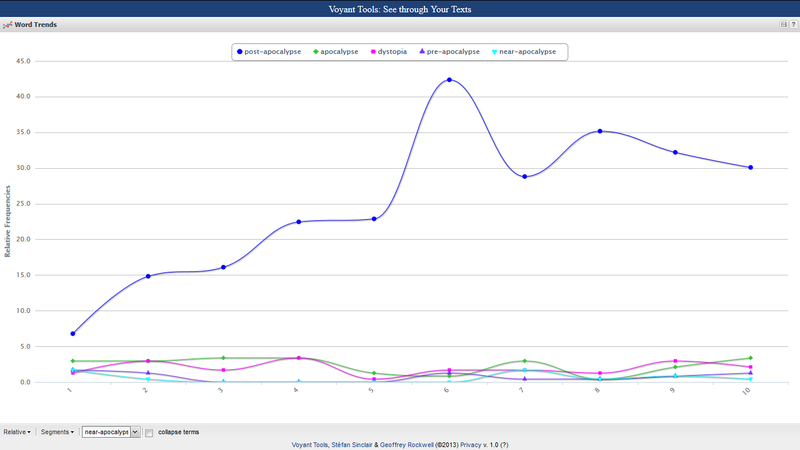 Voyant Tools provides a number of visualizations, such as word clouds and trend graphs. 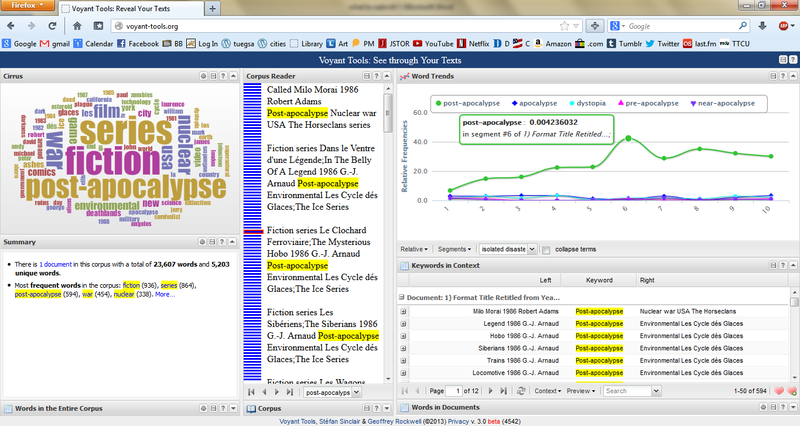 The process can be started very simply by pasting a text corpus into the dialogue box, and can then become more complex as stop-words are assigned and specific trends are highlighted. 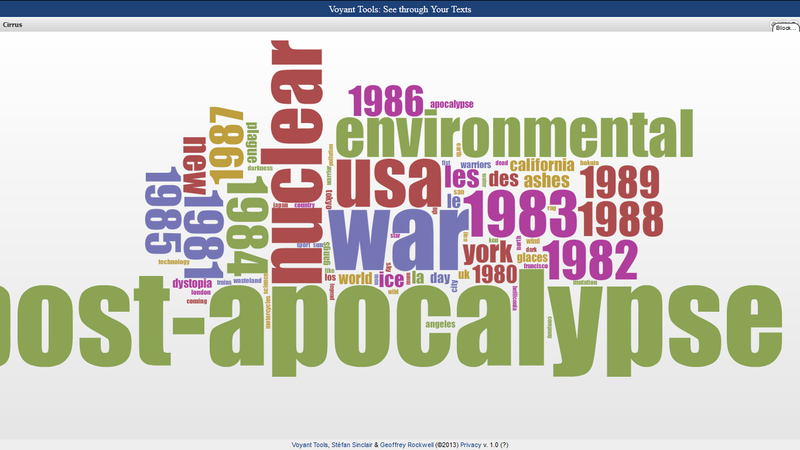 Of the “Type” column, “post-apocalypse” is one of the largest words in the cloud, with “apocalypse” and “dystopia” both present, but notably smaller; “pre-apocalypse” and “near-apocalypse” do not make an appearance. Of the causes, “nuclear” and “war,” predictably, represent the largest frequencies, though “environmental” is surprisingly close, and “technology,” “science,” and “plague” are not too far behind. “fiction” and “series” represent the largest “Format” categories, though “film,” “comics,” “video,” and “game” appear prominently too. “les,” “cycle,” “des,” “glaces,” “ice,” “deathlands,” “outlanders,” “ashes,” and “arnaud” also reflect the prominence of fiction series in the database, referring to G.-J. Arnaud’s “Les cycle des glaces” (or the Ice Series) and the “Ashes,” “Deathlands,” and “Outlanders” series. Most interesting, and rather unexpected, is the fact that each year of the 1980s is represented here, but there is no other year present but these. Of the years that appear here, 1983 is the largest, with 1984 close behind. This really indicates that I should look at that era in more depth, and into the context surrounding the boom in texts at that time. According to this graph, war seems to always have been a major concern, though it peaks at segment 2 (around 1948), has a slight resurgence in segment 4 (1972), has a significant peak at segment 6 (1986), then drops again before steadily rising from segment 9 (2003) onwards. 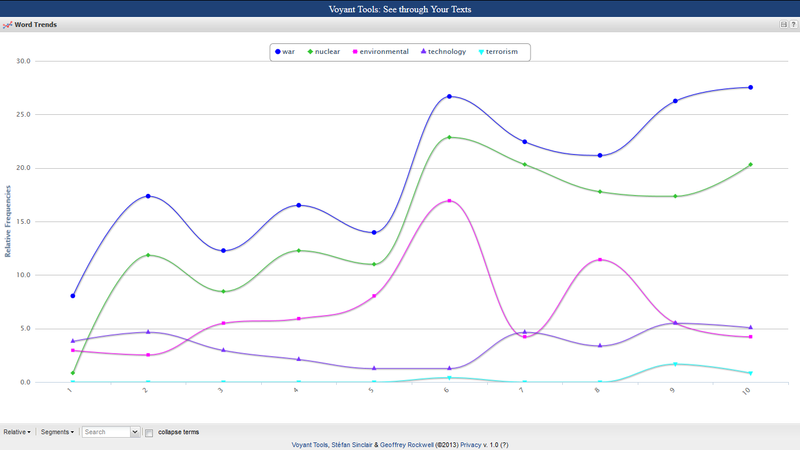 “nuclear” follows this trajectory, as not all wars in the database are nuclear, but most things listed as nuclear are wars (the exception being nuclear accidents, which could explain the steeper climb around segment 6 around the time of the Chernobyl disaster). “environmental” was surprisingly strong, particularly in segment 6–so, though many apocalyptic fictions were produced around man-made apocalyptic events in world history, not all of the disasters they depicted were man made. As is to be expected, “technology” started strong as modernity and the industrial revolution began to unsettle many writers, and has had a recent boom again, as artificial intelligence, computers and the internet have sparked new fields for speculation. Terrorism flat lines all the way to segment 6, and only becomes relatively strong in the 2000s, though it still seems to be an underrepresented area in comparison to the others. “nuclear” and “war” are very prominent here, but still “environmental” is showing to be very prevalent. “new” and “york” now are much closer to the size of “los” and “angeles,” and “san” and “francisco” are notably smaller. A strong ’80s aesthetic seems to manifest here, too, with a fairly strong representation of “aliens,” “mutation,” “pollution,” “gangs,” “motorcycles,” “science,” “plague,” “city,” “darkness,” and “technology,” that speak to a decade that saw the rise of cyberpunk and apocalyptic movies like Escape from New York (1981), Blade Runner (1982), The Terminator (1984), Aliens (1986), and Akira (1988). 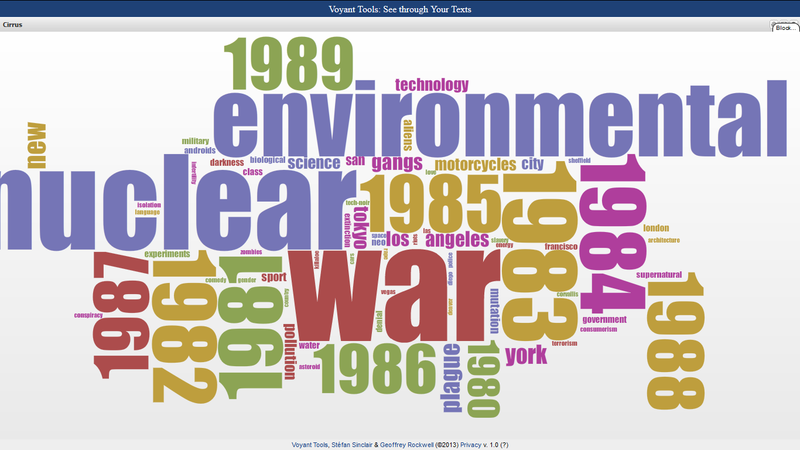 Primarily what these results show is the importance of the 1980s to the genre, but they also show that despite the concerns with nuclear war the decade also produced a large amount of natural disaster fiction. This looks to be an area I will need to place extra focus in my research.